The portable battery-operated hand torch introduced by the Ever Ready company in the 1890’s was made of crude paper and fibre tubes, with a bulb and rough brass reflector. Because the batteries were weak and the bulbs primitive, these hand torches only produced a brief flash of light – hence the name ‘flashlight’. A few decades passed, the company changing its name to Eveready along the way, to produce this fine example – likely from the 1930’s. 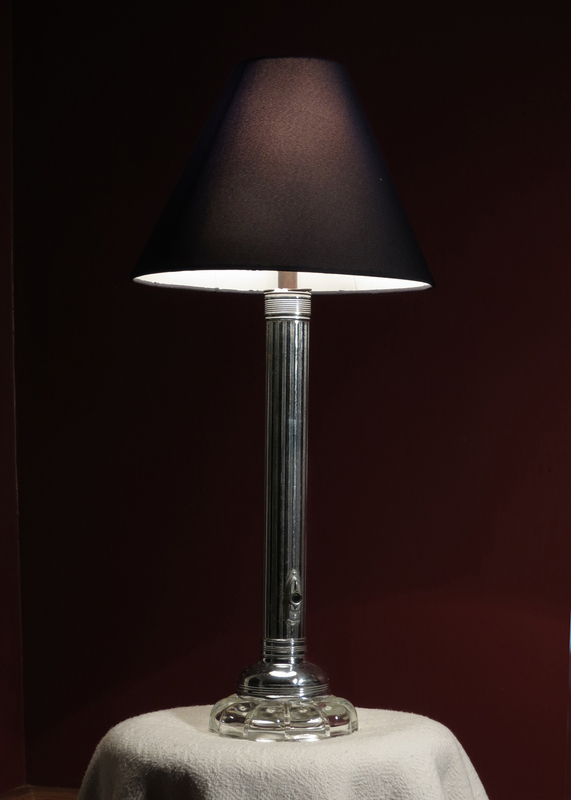 This beauty has had it’s glass and bulb removed, inverted atop a vintage glass lamp base and given a black shade, to produce an elegant lamp that looks distinctly modern, until you realise it’s actually a vintage flashight. All electrical parts are new. Comes with a standard base socket that is recommended for a bulb up to 40 watts (or 60 watt CFL equivalent) and approximately 6 feet of silver vinyl cord with an in-line rotary switch. Please be sure to read the Safety Information before purchase.